With respected trainer, Harry Monger. Life, as they say, can be a funny old game. 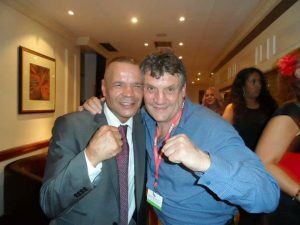 When Tony Rabbetts was eight years old and his father sent him down the boxing gym to follow in the footsteps of his brothers, Tony was far from over the moon about the prospect. However, the way things worked out, Tony’s dad did boxing a hell of a favour. Founder of the Twickenham Brunswick Boxing Club, for 30 years Tony has worked hard at the grassroots level of our sport. On a personal basis, Tony is very much one of the lads, although he freely admits that he loves a game of bingo. He is a straight talker who doesn’t beat around the bush and, in his own opinion, he is one of the stricter types of trainer. At the same time, Tony has solid compassion for the young men in his charge, men being the operative word, as he doesn’t hold with women boxing because he thinks they should look nice and he doesn’t believe that they should have flat noses. With former stable-mate and old pal, Gary Hobbs. 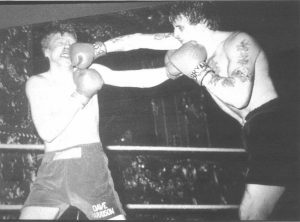 Tony Rabbetts landing a right cross on Dave Harrison at the Lyceum Ballroom in February 1983. 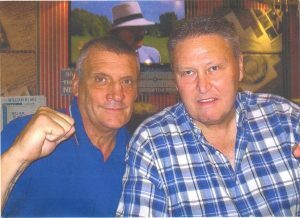 With The Explosive Rocky Kelly, still great friends after all these years.